Successful aging is not only measured by how long you live, but by how well you live into your old age. A new research study has found that if you engage in physical activity more than the recommended guidelines by the World Health Organization, you'll have a greater chance of living healthily, longer. So how do we define "successful" aging? Living longer while living independently, being socially engaged, avoiding avoiding disability, cognitive impairment, respiratory symptoms, chronic disease (cancer, coronary artery disease) and depressive symptoms tens years later. That's the goal. The World Health Organization (WHO) currently recommends approximately 150 minutes of brisk walking or 75 minutes of running a week, plus 2 days of strength training a week. This study is suggesting that we need even more vigorous exercise than that recommended by the WHO to age successfully and avoid chronic disease and other health issues commonly associated with aging. 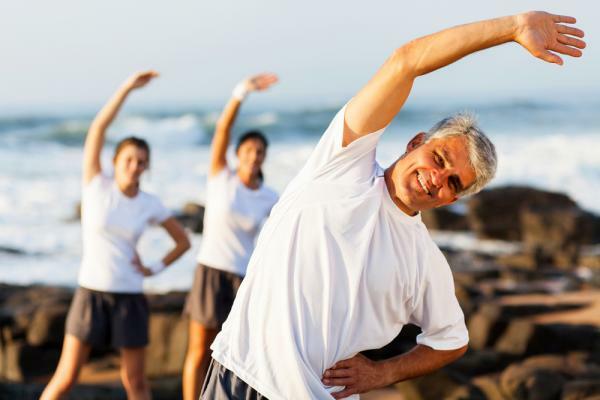 The study revealed those who did the recommended amount of exercise increased their chance of aging successfully by 15%. But for those that did 3 times the amount of exercise, they doubled their chance of aging successfully. While not everyone can do vigorous activity, the study's lead researcher Associate Professor Bamini Gopinath, recommends they do some light to moderate activity to help their health. However for "those who currently only engage in moderate exercise to incorporate more vigorous activity where possible." So how do the researchers define "more vigorous activity"? If you performed over 5,000 Total Metabolic Equivalent minutes per week, it would be considered more vigorous. We'd use the WHO guidelines as the baseline. Walking would not be considered vigorous, while running would. So if you chose aerobic exercises like running, swimming, biking and performed them at a healthy clip, it would be considered a vigorous activity. The key here is that you can improve your odds of living more successfully by either increasing the intensity of your physical activity, or by doing more activity or by a combination of both. However you do it, the WHO recommendations come out to about 600 MET minutes per week, while the study recommends greater than 5,000 MET's. Interestingly, the researchers do not know why an increased level in total physical activity increases the likelihood of aging more successfully. Theories range from reducing inflammation to maintain the health of telomeres. The conclusion of the research is consistent with much of the newer research in the field, that the more exercise we do, the more we lower our chances of developing chronic diseases such as diabetes, cancer, stroke and heart disease. Both this research and previous research suggest that by do many times more than the WHO recommended guidelines for physical activity we can age even more successfully.